How can I get students creating podcasts? How do I publish my podcast on the internet? G’day all. 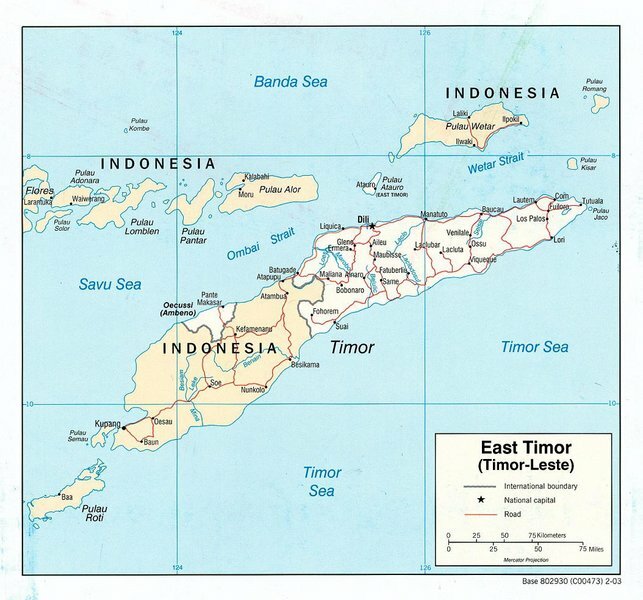 I’m beginning a unit on Timor Leste (East Timor) with my Year 8s this week, and planning to do a stations strategy again, including a podcast introducing things. 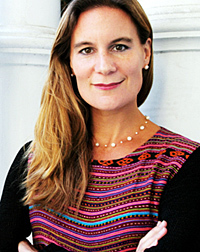 I was lucky enough to be able to interview Kirsty Sword-Gusmao, so that forms part of the podcast as well. Last week we had Major Daniel from the ADF come and present about his time in Timor, which was fantastic…the boys were mainly concerned with whether he had killed anyone, thrown a grenade into a house etc (no and no if you’re interested). Regular readers of this blog will know that I take my students on a one-off competitive fieldtrip around Bendigo, during which they use podcasts to complete tasks about the history of Bendigo, and hence, Australia. However, I’ve got a particularly ratty (for the PC – energetic, students with different learning styles, cute) students and I need to get them out of the classroom more regularly. So, every 3 weeks we’re going out on the public bus into town and spending an hour at various locations. We had a minor glitch when 5 students failed to turn up at the bus stop, and being a public bus we couldn’t wait…needless to say it was a few students who I didn’t mind leaving behind. John took us around and was an excellent guide, and the students really took to the tasks. At the end, 2 students that we’d left behind turned up, and one tried to skateboard down the gloriously smooth and hard aisles of the cathedral! He had a quick exit. Last week I presented at a PD for history teachers on how to integrate technology into history learning. Great diversity of teachers from primary, secondary as well as state, Catholic and private. They recorded their own podcast – listen here! A big issue for the secondary teachers was access to technology – computer labs always booked etc. I think that computer labs will be less and less needed, except for ICT-specific subjects. It’s very rare that whole classes need to be on computers simultaneously, except for word processing, which is a pretty lame way to integrate ICT. I think that the way forward lies in having smaller amounts of accessible technology ie. pods of computers in or between classrooms, and in having a variety of activities, some of which require ICT. iHistory is being featured in an educational journal called Learning and Leading with Technology. This came about because I took part in some research about education and technology, which is being produced into a book by the International Society for Technology and Education. They’ve put together an article that is a forerunner to the book. Go here for a look. We’ve got 3 weeks after exams, so my students are making podcasts and vodcasts (video podcasts) to exchange with a school in Singapore. Topics include the school, life as a teenager in Australia, Australian culture etc. They’re really getting into it, and one student is using his musical skills to provide backing music. My thought is – how to integrate student production of podcasts (not just consumption) into the everyday curriculum of Australian History and SOSE? I produce a lot – they don’t. We just recently completed the excursion using podcasts to learn about 4 historical sites in Bendigo: the old gaol, Sacred Heart cathedral, statues in the CBD and Victoria Hill mining site. We skipped the Joss House, as 4 places is more than enough. Thanks to the folks at Future Connections for showing us through the gaol, and to the teachers who supervised. 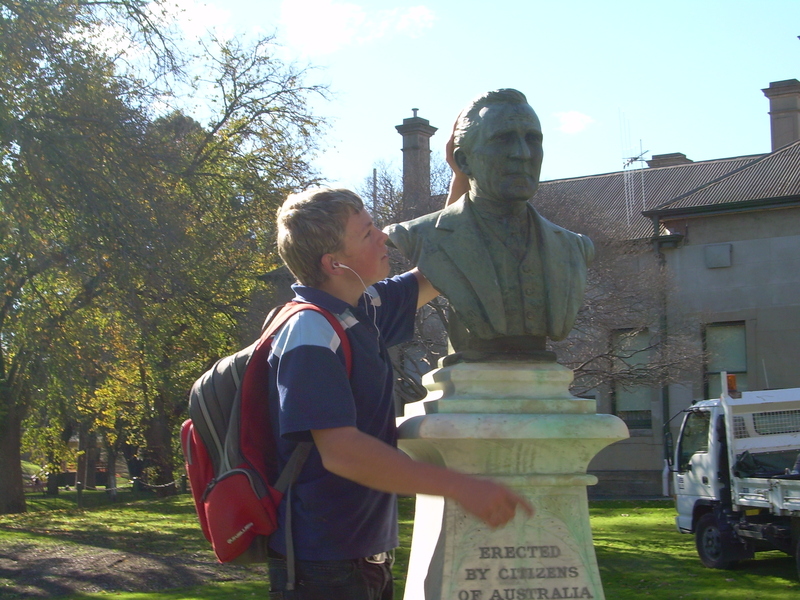 Here’s just one photo – of Macauley giving John Quick (one of Federation architects) some loving attention. Today I’ve been at the Student Forum for the Friendship Schools Project. 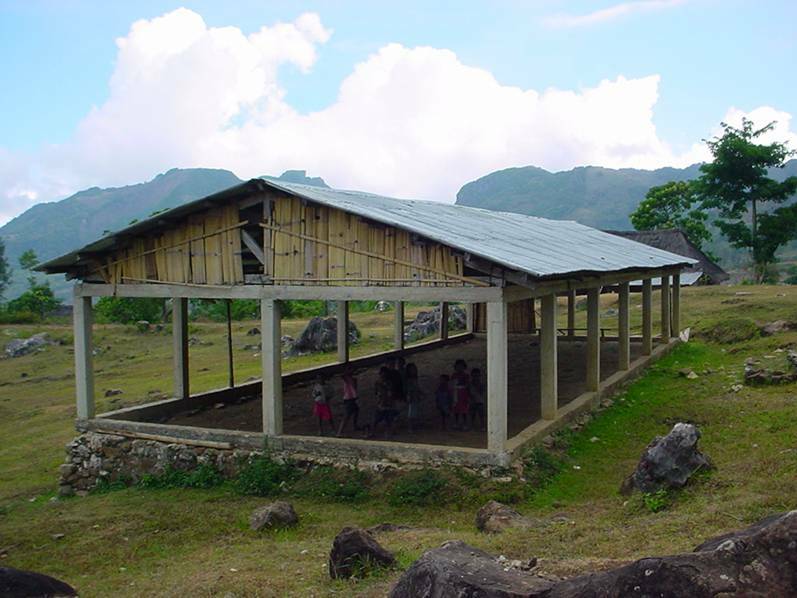 Heaps of schools across Victoria have a connection with a school in Timor-Leste (East Timor). Ours has been going for the last 4 years, with Ossa Huna Pre-Secondary School in Ossa Huna, Baucau, which is east of Dili. The student forum includes workshops on music, dance, drumming, singing, because this year’s theme is “Mia Festa” – “Let’s Party”! Also, we’re raising money for musical instruments at our sister school, through BBQs and a movie night. All you coffee drinkers out there, if you want to drink coffee and feel good about it, I’m selling Timorese fair trade coffee to raise money. Thanks to the initiatives of a group of students who are creating radio programs at our school for Vision Australia, I decided to get an interview that could be a segment on the show. But what could I do?